It’s safe to say that horror, much like film on the whole, is going through a creative dearth at the moment with the last few years overly populated by Exorcist inspired possession plots that have been milked dry of any ingenuity or scares, replacing them with stupidity and predictability. Amongst the genre’s worst creations, such as Mama and The Last Exorcism Part II (or was part XVI? ), is the odd ray of hope for horror, You’re Next looked like it could be a classic purely based on the trailer-set to Lou Reed’s Perfect Day, a fresh take on the home invasion story that was wonderfully pioneered by Dustin Hoffman and Straw Dogs (the 1971 version). You’re Next has all the makings of the classic horror that gives frights and jumps aplenty in the dark, isolated setting of a rural country home. The Davison family are having a long awaited family reunion at the parents’ massive, mock Tudor home in the country with the three children, and their partners, coming round. As the family begin to arrive we see the cracks appearing in their relationships as they become more dysfunctional with every word exchanged- brothers Felix and Crispin resurrect their sibling rivalry and their mother’s mental problems are slyly hinted at. While the family bicker a sinister presence is lurking outside, and inside, the house unbeknown to the Davisons. Just as the reunion dinner turns into a slanging contest the house is attacked by a group of animal masked assailants, like a psychopathic version of Wind in the Willows. Arrows reign in on the dining room and the assault begins, reminiscent of Straw Dogs, Friday 13th and The Strangers, with a frightening game of cat and mouse in the house. Although the film jumps between the characters it’s the couple of Erin (Sharni Vinson) and Crispin (AJ Bowen) that are in the spotlight from the off making it fairly obvious who is likely to be leading the charge against the mystery attackers. The first half of the film functions as a typical horror affair, tension is built up around ghostly apparitions in windows and corridors along with a general fear brought from the unknown attackers-who they are, what they want and mostly horrifying, where they are in the house. It’s a welcome return to what makes horror so appealing, reducing it to the bare-bones of keeping the audience on the edge of their seat, peeping out behind cover in anticipation of someone jumping out from the next corner. Halfway through the film the narrative takes a surprising twist that completely changes the direction of proceedings, venturing away from the suffocating suspense in exchange for over the top gore and violence. It’s a move that doesn’t entirely work, the element of fear is completely removed which destroys the suspense that You’re Next had done so well to conjure, the unknown threat becomes disappointingly human while stupidity, rather than black comedy, creeps into the fore. Once the second phase of the film takes full flight it becomes apparent how much the film pays homage to the genre’s great originals, either paying direct tribute to them or putting a clever twist on them. Some sequences will be instantly recognisable while others will only be obvious to the most ardent horror fans, it’s a treat for viewers and a testimony to director Adam Wingard that he’s managed to successfully implement these homages without reducing the film to a rehash of old ideas, the most impressive scene a clever reworking of Hitchcock’s brilliant thriller Rear Window. Once you look beyond You’re Next being a tribute to all those genre defining horror gems of the past there isn’t a whole lot memorable about it. The violence is obligatory without being appallingly gruesome enough to be warranted and the story is fairly pointless as the fascinating backstory of the families’ private life is forgotten once the assault begins. 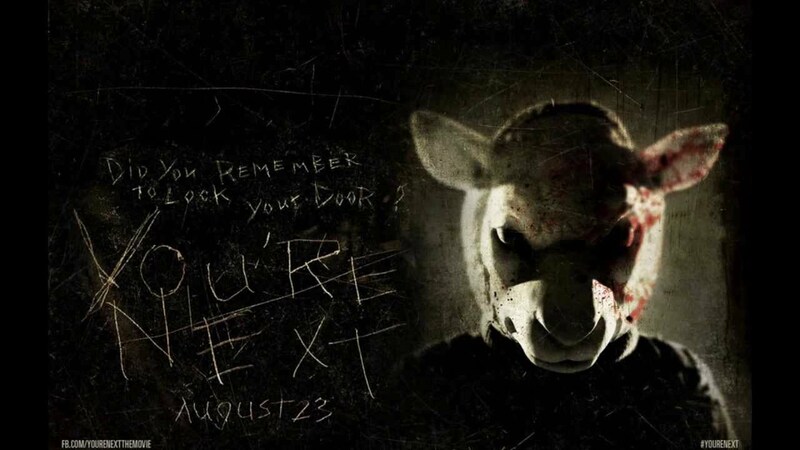 There are some well worked moments in You’re Next, bar the classic horror homages, that show a stylistic approach beyond the expected slasher moments, the solitary soundtrack of Lookin for the Magic by Dwight Twilley Band is strangely suited while a couple of plot twists keep the film fresh to the end. You’re Next is a deceptive film, billed as pure thrilling horror it becomes almost a parody of the genre through some inopportune humour that comes too late to be taken without apprehension as to whether its suitable. Wingard has cleverly turned convention on his head as midway through a traditional horror plot he exposes loopholes and issues that the genre is often riddled with but very rarely addressed, imagine if Michael Myers in Halloween was a bit clumsy and inefficient rather than the ice cold killing machine he’s portrayed as, You’re Next is the amusing reality to the horror’s mostly unreliable truths. Wingard’s has tried to break the mould of home invasion films and horror as a whole without the conviction needed to really make something lasting or different. You’re Next doesn’t break too far from convention- containing a splattering of gore, a half of suspense and an unconvincing attempt at self-deprecating humour. There are some good ideas but it doesn’t match its ambition ultimately, at least it’s not another film about exorcism.